The curse of interesting times is upon Azeroth. For close to a decade, millions of people have been vacationing in Blizzard’s behemoth of an MMO, World of Warcraft, but in the face of a plethora of free-to-play alternatives and a constantly evolving genre, the titan has been going through a decline, losing over 600,000 subscribers over the last quarter. We caught up with lead designer Tom Chilton at Gamescom to find out what Blizzard’s doing to tempt players to stay, its plans for monetising the game further and what the future holds for World of Warcraft. It’s been a strange week in the MMO space. The Elder Scrolls Online was revealed to be employing the subscription model, while WildStar will be adopting a model similar to EVE’s. At a time when most MMOs have moved away from subscriptions, these were two surprises. World of Warcraft has proved that in very specific instances, subscriptions can be maintained, but as the numbers have declined, Blizzard has been exploring new revenue streams. Most recently, it’s started to sell premium helms. Chilton wants to see people still work towards earning gear, rather than simply buying it. He doesn’t want to make raiding seem less rewarding, and that will remain the main way players earn the top tier items. This does not mean that premium items will not continue to be released and sold, rather that Blizzard is thinking of making them more “fun”. He mentions a Halloween costume, or other pieces of gear that will be purely cosmetic and themed – stuff that you won’t find in a dungeon. The draw of the subscription model, on the consumer side, is that the monthly payments ensure that access to all content is granted. While extra, premium content flies in the face of that, Chilton emphasises that there are players who are more than happy to part with extra cash. “We do want the players that want to spend more on the game – and believe me, there are players out there that want to spend more on the game – we want to give them outlets to be able to do that.” Although he wants to offer more of that sort of thing, he’s still cautious, not wanting to make players feel like they are being squeezed. Chilton doesn’t see Blizzard significantly changing how much individual players spend, though. Cataclysm, I feel, managed to achieve some of this. After leaving a few months after the launch of Wrath of the Lich King, the extensive overhaul of the vanilla content not only drew me back in, but inspired me to make yet another alt (and then another), and I was able to experience the new areas and quests immediately. World of Warcraft’s playerbase suffers the occasional dip when a new MMO comes out, but according to Chilton it’s barely measurable. The most significant impact of a new game was actually Diablo III, and the effect only lasted for a couple of weeks. Even between expansions, where there’s a year or more gap, the end game playerbase remains quite stable. The main reason for decline in that period is the lack of new or returning players rather than existing ones migrating to new MMOs. There are, however, plans to increase the pace of content updates to keep players engaged longer. With a 40 percent increase to the size of the team, and another 40 percent planned for the near future, Chilton hopes to see some sort of content patch every month, with new raid tiers being added every three to five months, and an annual expansion. They aren’t quite there yet, though. 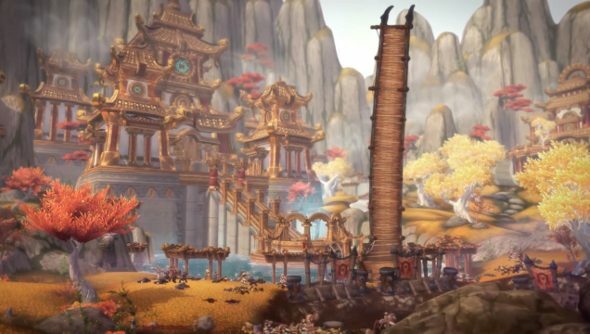 Mists of Pandaria was released almost a year ago, but the next expansion is still some ways off. 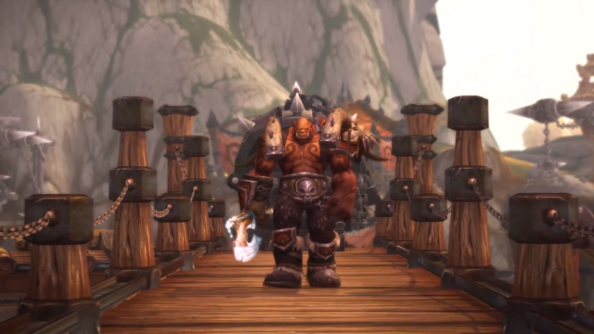 As to the question that folk always seem to be wondering, “Will World of Warcraft ever go free-to-play?”, it’s certainly not on the cards, but Chilton does admit that it’s a possibility: “There may be a day when we’ll say World of Warcraft’s going to be free-to-play and we want to go to this other model.” One day, perhaps.